Taught exactly as Josh played them on the original recordings! For over 20 years, these have been the materials that Dobro players have cut their teeth on! Volume 2: On the tape each tune is played once slowly and once at normal speed. (Written in 1975, the production quality is fair but the solos of Josh are classics.) (CD & Tab) Tunes include: Buck's Stumble - Flint Hill Special - Shuckin' the Corn - Wabash Cannonball - Foggy Mountain Chimes - Flatt Lonesome - Groundspeed - Salty Dog - Cannonball Blues - Lonesome Road Blues -------------------------------------------------------------------------------- About Dan Huckabee Dan Huckabee, has a degree in Music from The University of North Texas. 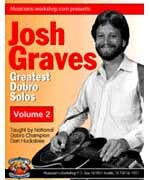 He won the National Dobro Championship, & has played with The Allman Brothers, Lyle Lovette, Nancy Griffith, & Robert Earl Keen Jr, just to name a few. Dan founded Musician's Worskhop in 1973, teaches Guitar, Dobro, Mandolin, & Harmony Singing at The University of Texas Informal Classes, has taught workshops & seminars at festivals all over the United States, & has authored over 250 music instructional products. So get comfortable & let Dan's lifetime of musical experience guide you through everything you need to know in the quickest & easiest way possible!